Sam is a third grade student at Holly Grove Elementary School. All third graders are assigned a Community Service Project to be completed in the spring. 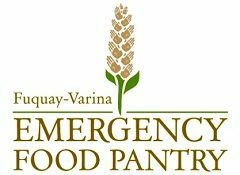 Sam chose to do a food drive to benefit the Fuquay Varina Emergency Food Pantry based in our neighborhood. He started by sending out an email to the neighborhood list serve introducing himself and his service project. He stated that he would go door-to-door during the weekend of May 19 and 20 seeking donations. He spent three hours knocking on doors. Our neighbors were generous and openhearted, filling the back seat of my car.